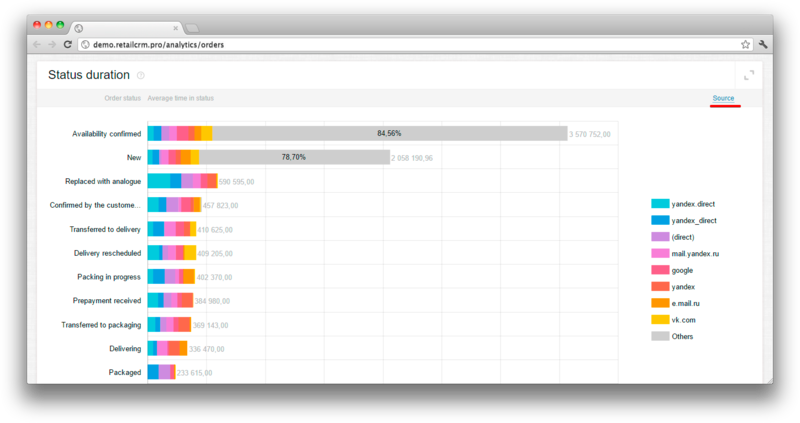 In section “Analytics of orders” you can see analytics data of orders from all the shops or only from a definite shop that might be of your interest. 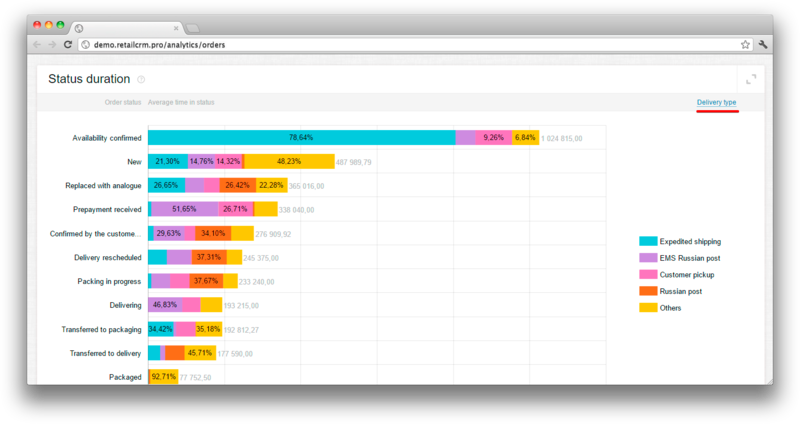 You can also see analytics for a definite time period. Note: analytics of oders is updated once an hour. If there are changes made in analytics, then you will see already changed data. The heading of the page has a unified filter attached, which holds its position when scrolling. Filter data on key order types: created, completed or paid. Important: If there is a global filter by paid or completed orders, then the graph can go beyond the specified range of dates, being guided by order creation date. 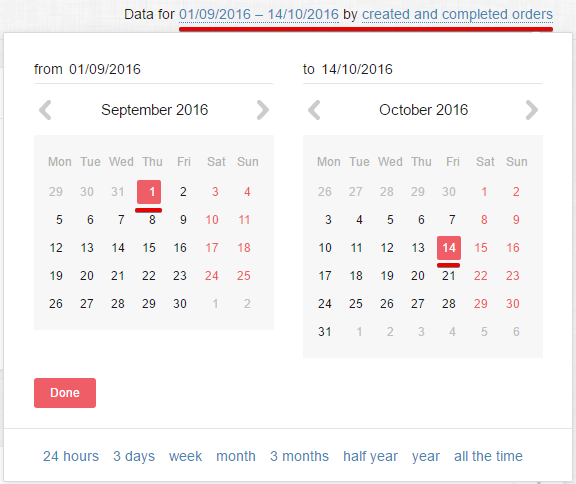 For example, if you need data for a month for created orders, you select the date needed and data output as its shown on the screenshot below. If you need data for a definite date, and also for created and completed orders, select the date and data output needed as its shown on the screenshots below. Note: it is possible to choose all the three options. I.e. the data will be collected for created, completed and paid orders. Pay attention, that information on paid orders in filter is being formed at the fact of full order payment. There are column and filter by full payment date in the order list. Below the statistics there is a gear icon, pressing which allows you to configure the panel. As you see on the screenshot, there are headings of all data of KPI displayed. NEar each of them there is a mark, allowing to activate oe deactivate reports on the chosen criteria. It is possible to move blocks, in order to place them in the needed order and to turn off those that are not needed. It is possible to create new widgets. You need to press the gear button in order to configure the widget. There is an order filter “Do not include cancelled orders” set by default. This way the report is made for all orders except those, that are in “Cancel” status. Do not include orders with zero cost — if you tick the box near this filter, the orders with zero cost will not be included, for example orders that were made via the phone. Do not include delivery cost — if you put the mark near this filter, then delivery cost will not be included. For example, the delivery cost is 10$ and the net cost is 6$. In this case 6$ will not be included, and 4$ will go to the shop income. Some key indicator values are displayed in minimized mode. 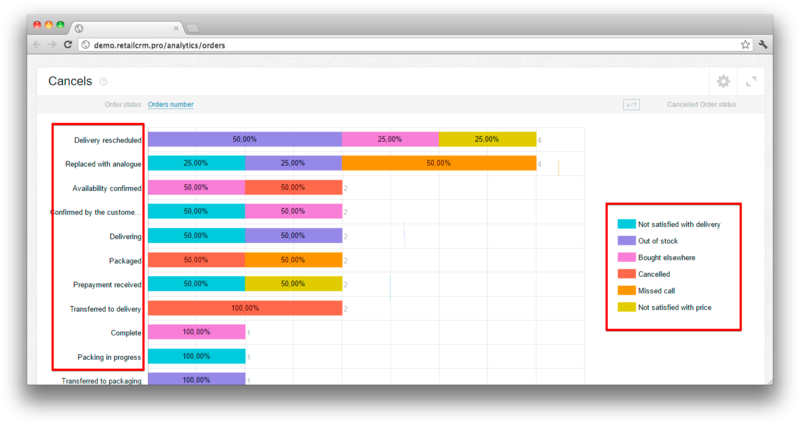 If you press the name, the indicator is highlighted and the part of the graph is displayed, containing the maximum value ever reached. The graphs present data depicting the change of indicators in time. Time units are displayed horizontally, metric values - vertically. The red colour of indicator tells of value decrease in the current period in comparison with the previous one (for example, for the last week in comparison with the previous week). The percentage in small print in the top of the indicator displays the change of the current value in comparison with the previous one. If you mouse over the graph, the scale will appear showing the date and income in the chosen unit of time. 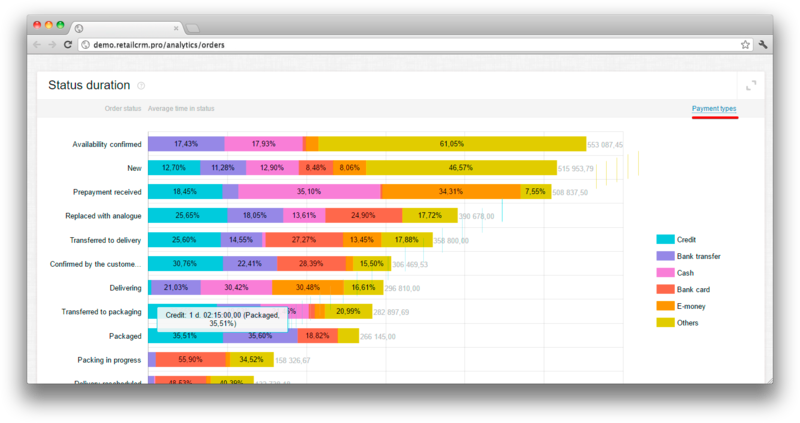 The view of all available indicators and graphs on a single page is possible in maximized mode. Let’s have a look at each indicator separately. “Income” indicator displays the general order sum for the given period. “Paid” indicator dispalys total sum of paid orders for the given period. The “Number of orders” indicator displays the total amount of orders for the given period. The “Gross profit” indicator displays the profitability index for the given period. The “AOV” indicator displays the sum of all purchases made by the customer for the given period of time divided by the number of tickets for the same period. The “Repeated sales” indicator displays the number of repeated sales for the given period. “The proportion of cancelled products” indicator displays the number of cancelled orders for the given period. The “Purchase cost of sold items” displays the sum of purchased orders that were sold in the given period. The “Average order processing time” indicator displays average spent time for order moving to “Completed” status. Note that the average processing time is only affected by the chosen time period and store in filter. The widget can vivdly show the whole way, which customer makes, from getting on the website and registering the order, to completing the order. It helps to detect on what stage and why the difficulties appeared. There are two tabs in the widget containing process visualization tools. Sales funnel — is an analytic instrument which is based on the principle of allocation of customers by process stages from the first contact to the closing of sale. The notion of the sales funnel means that the sale - is a process, that consists of stages. Potential customer and salesman go through the stages of sale process: from “cold” (upper) one to “warm” (lower) one. At that, the first stages of sales for the e-shop start from the moment, when it crossed the threshold of the shop website. It is recommended to track earlier stages of the funnel - showing ads banners, announcements, i.e. the very first contacts of the audience with the e-shop. Such sales funnel is displayed in the system by the means of data aggregation and visualisation from the web-analytics (Google Analytics) side on the one hand and from the system side on the other hand. On the screenshot below you can see data for the period set in the unified filter attached to the heading of the page. The graph “New” is active. Each line means how many orders in total moved from the previous stage to the next one. 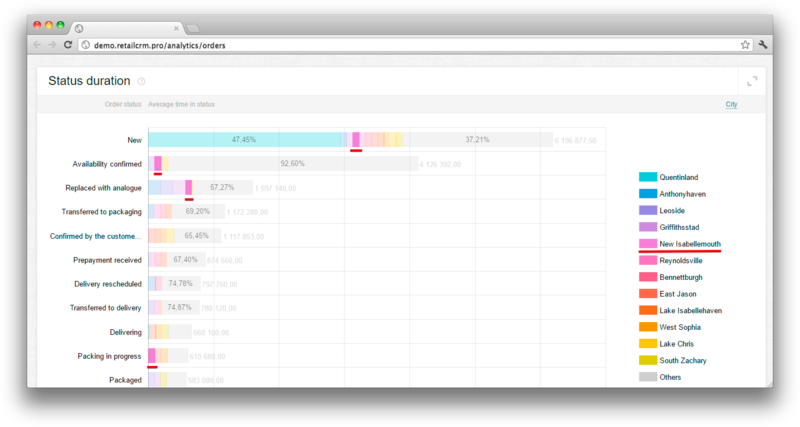 If you mouse near the line, you will see an element, that visually displays the percentage of orders moved from previous status to the following. It is important to understand, that the “New” tab doesn’t display current allocation of orders by stages. Every stage in it corresponds to orders data received in a specified period or ever moved through this stage. At that the orders themselves can be in other stages. The number of orders moved to the current status for the chosen period is displayed in “Change status” tab. At that, in this case, in contrast to the “New” tab, all the movements to the status are calculated. The “Now” tab contains information only about the current orders state, namely - how many orders are at each stage at the moment. The dialogue with the customer begins from the loading of the e-shop landing page. The aim of the shop website elements - to help consequetly find the neede item, explain the conditions of sale and receive the order. After that the life of the order inside the company starts, then the order goes to the delivery service, where from it goes to the customer. This is the total number of unique customers who visited the website during the specified period. It is taken as 100%. The customers who didn’t leave the website after browsing the first page. In most cases, landing pages for an e-shop are as item pages, as well as specially prepared for these aims “landings”. These are the elements of the first contact of the customer with the shop. You can estimate the quality of these elements by the well-known refusal indicator. Proficient customers are those customers who stayed on the website. They have behavioral response similar to the e-shop customers response. To display the percent and number of proficient customers for the given period, the additional configuration of Google Analytic segments in system and the folowing download of proficient customer segment indicators through the API in system is needed. In order to configure proficient customer segment correctly, you need to make a preanalysis of the behaviour of the customers, who make orders in your shop. The percent of customers, who moved from the “stayed” category to the “proficient” category shows us how many people started to use your website actively as your customers, started to search for items, learn the information about payment and delivery, but at that, part of them didn’t put the order to the shopping cart. There are issues that are not connected with convenience and eye appeal of the shop website. These issues are business ones - at what price you sell the items, what is available for purchase on the website, under what terms and to what regions you make the delivery, what payment methods you accept. The influence of these issues to the income needs to be tracked by the percent of moving from proficient customers to shopping carts and new orders. A special attention needs to be paid to these indicators when payment and delivery conditions are changed. 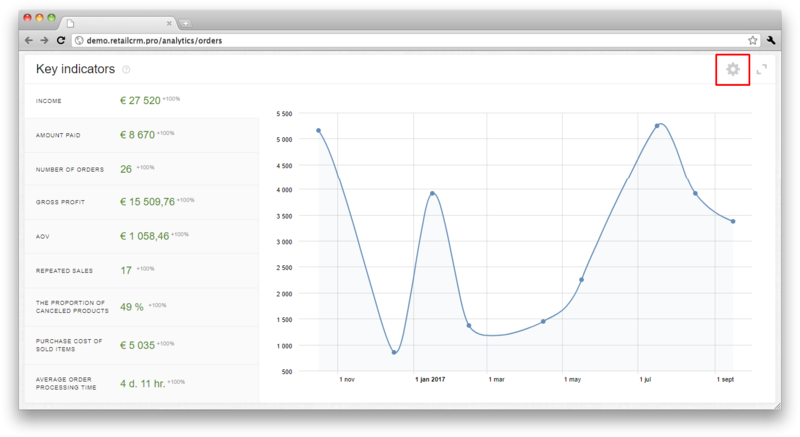 An additional Google Analytics configuration is needed to track shopping carts. The conversion from shopping carts to new orders is a good indicator to control convenience, understandability, absence of technical and logical errors in your checkout. But you should remember that service delivery provision conditions still play a great role at this stage. Part of the customers pay attentintion to delivery conditions only after they fill the shopping cart and start to register the order. The same thing happens with the methods of payment. In case of equal distribution of orders between shop managers, the relative co-worker performance can be inferred by the indicator of approved and clarified orders. The logistics factor is also added to the value of this indicator - it is how up-to-date are the leftovers and how accessible is the assortment. Track the value and the dynamics of conversion of new orders to clarified/approved and also for personnel work estimation in the perspective of managers. It is recommended to configure the automatic monitoring and notify the management in case of breaking the set indicator terms. The more the percent of approved orders that moved to batched - the better things are going at the delivery service. If you decided to integrate new technologies of automated order batching queue management, cargo unit and leftovers registration, then it’s better to estimate the effect of integration by this indicator. To track the warehouse work in the period of a peak season or intensive shop growth, it is recommended to configure automatic monitoring of this indicator. The indicator of conversion from bundled orders to shipped shows the coordination of work between the warehouse and the delivery service. And the percent of delivered items is the criterion of delivery service work. It is recommended to detalize this indicator by items groups available in managers orders. Track both of these indicators for quick business diagnostics. The orders that were received by customers. It is possible to add new fields to already existing purchase funnel in the system. 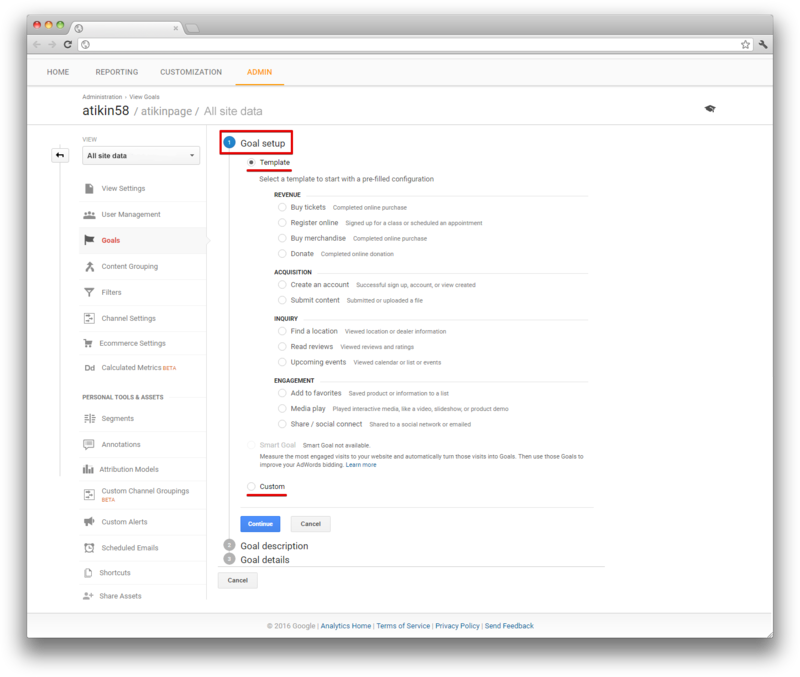 To get a goal ID in Google Analytics you need to create a goal. 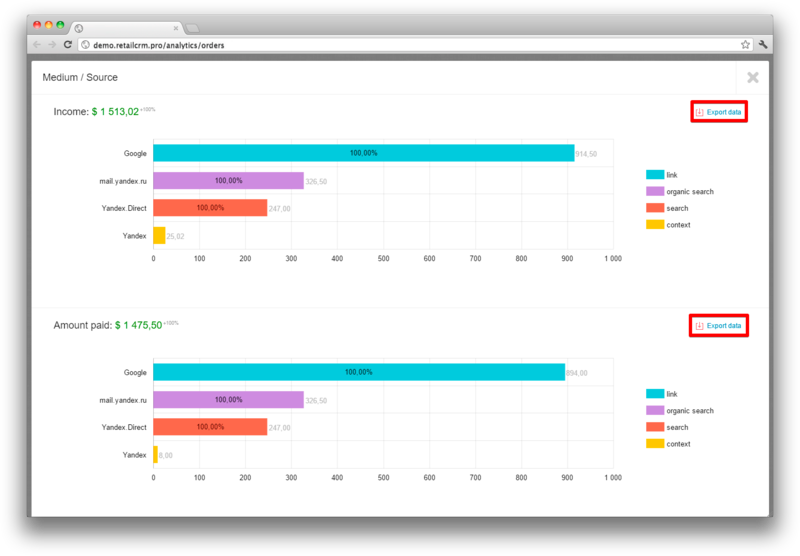 With the help of goals you can track user actions and the website effectiveness. You can set a goal yourself or use data from the template. 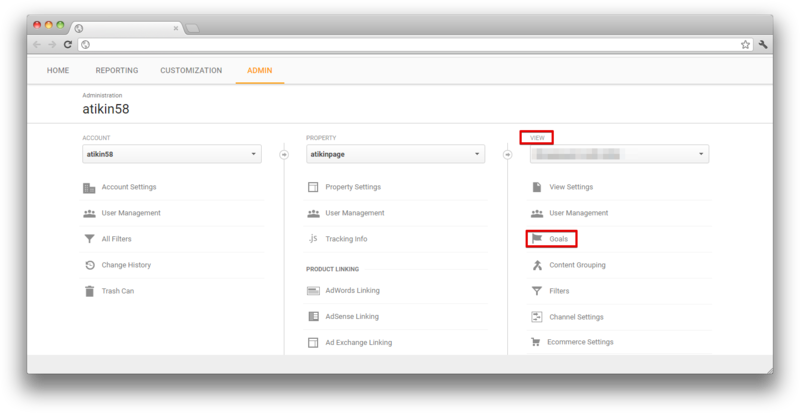 If templates are not displayed in your account, it means that you need to specify the “Industry Category” in section Admin > Property > Property settings. If you specify the goal yourself, you need to write in the name and choose the type. If you select the goal from the template, then its name and type will be atomatically inserted to the graph “Goal description”. Event (it can be pressing the button, watching video). Note: screenshots display an individual goal creation - visiting shopping cart, as a new stage of the purchase funnel. Value If you track e-commerce, leave the field “Value” blank. After you press “Save” button, a table with a new goal will open. It will correspond to the goal ID, that needs to be remembered. Pressing the gear at the right side of the window, a form will open, in which you can press “Add a step” and fill the fields for a new step. Let’s have a look at this feature on the example of adding “Basket” step. Goal ID (used for tracking information on the step). 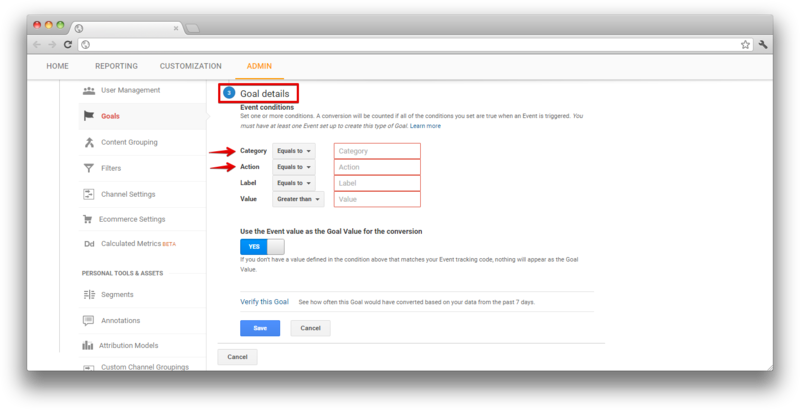 You need to insert to this line the goal ID, that appeared after creation of the new goal in Google Analytics settings. To change the order of the steps, move the needed step to any other place. After a while you will be able to collect data on the created funnel step. 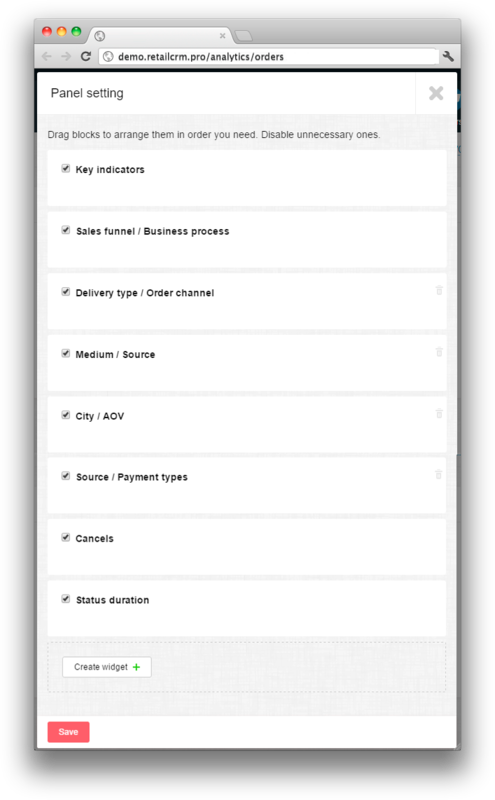 The generalised processing of e-shop order with displayment of data on orders in current state is displayed on the Business process tab of the main system page. Business process element corresponds to the group of statuses. The number of orders and the sum on the moment of browsing the report are displayed in it. Important: “Business process” widget doesn`t depend on filter by date, set above. There are indicators for whole period of system existence in this widget. The business process can be calculated in the view of a concrete manager by setting the corresponding filter. If you select a group of statuses in business process, a list of statuses specified for this group will open. 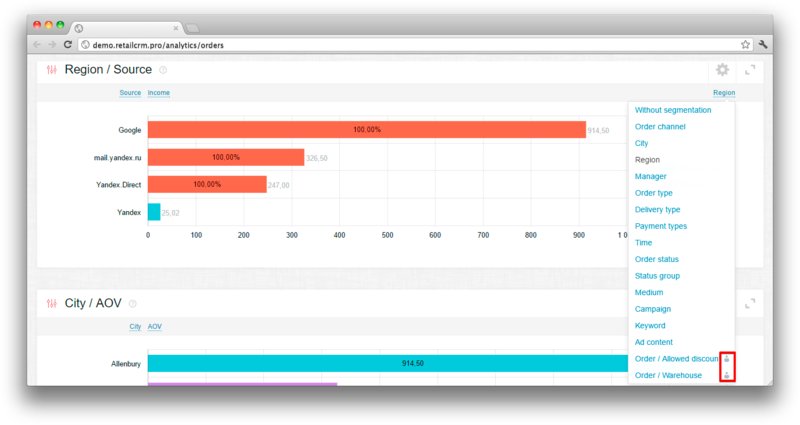 Each of them will contain the number of orders on the moment of the report view. 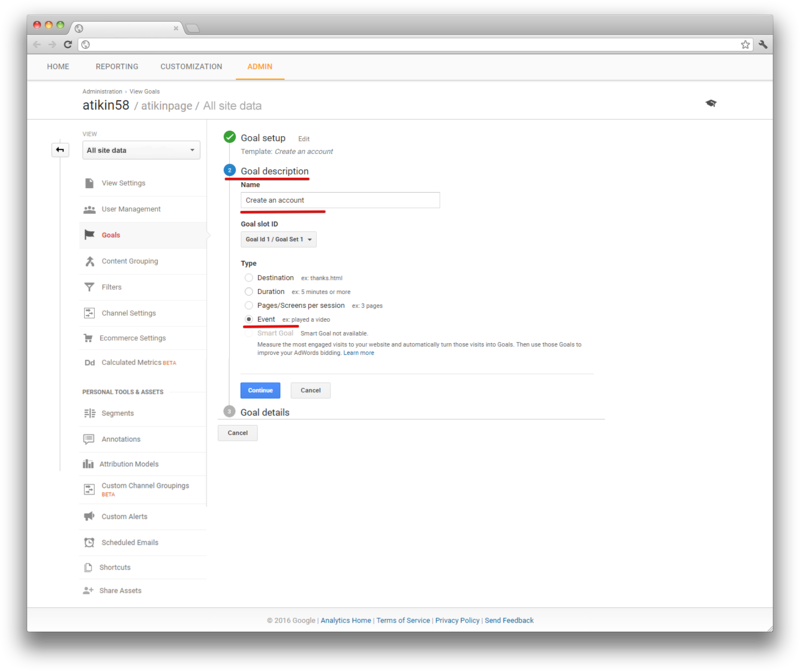 Clicking the number of orders in status the user gets to the order list, filtered by the corresponding status or a group of statuses. Let’s have a look at the example of “Complete” status. Clicking it, order page filtered by the selected status will open. The blocks of cancel statuses are displayed in a different way. This is connected with the fact, that orders from different statuses can move to “Cancel” and it is not possible to filter the list of orders by previous statuses, that were before the “Cancel”. I.e. if you click on “Cancelled” status in any cancel block, the list of all orders in status “Cancelled” will open. The system user can build a report as by all orders, as well as by orders assigned to a definite manager. New. Customer makes an order. Coordination. Order fact approval by the customer, discussion of questions by both sides. Assembling. The order is formed in the warehouse. Delivery. The order is delivered to the customer. Complete. The customer received the order. The report shows, in which statuses are orders most of the time and why. Off-hour is not considered. Settings of working time is in Administration > Settings > Settings, "Working time" and "Non-working dates" fields. The widget is divided to three axes “Orders satuses”, “Average time in status” and the third adjustable axis, in which you can select the needed data display parameter. Let’s have a look at each segment separately. Shows status duration when order comes from a definite city. If you mouse the name of the city on the right side, the areas in the main part of the widget are highlighted. 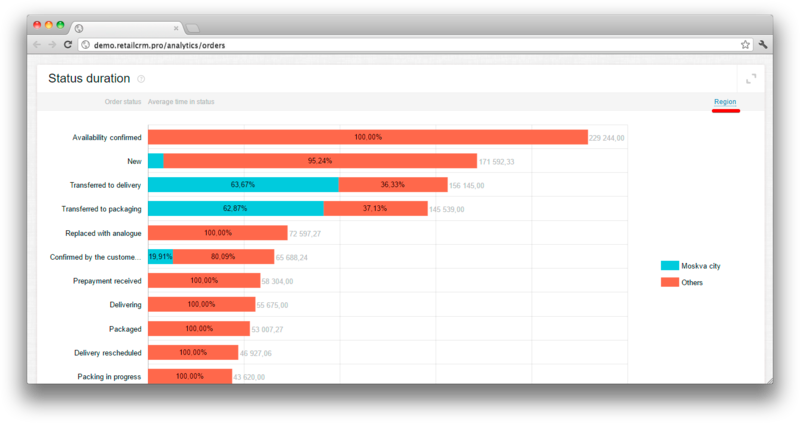 The data of the areas are displayed in percentage correlation to the main orders number in the definite status. When pressing the name of the city, the data of the area in the main widget part are deactivated. 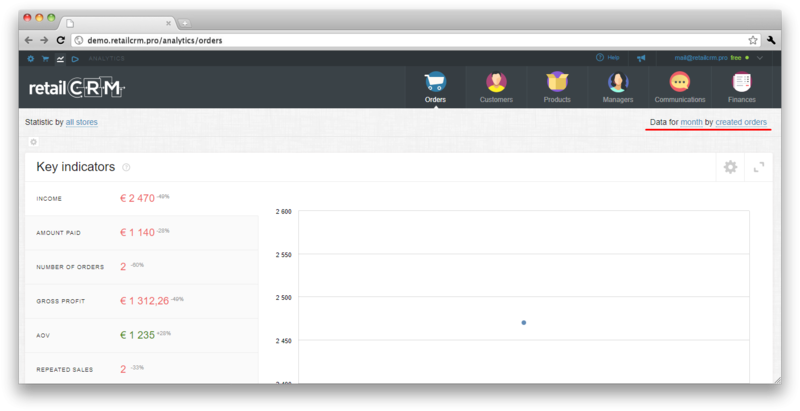 Shows the time in status by a definite way of order registration. Shows the time in status by ordering from a definite region. Shows time in status by the definite manager. 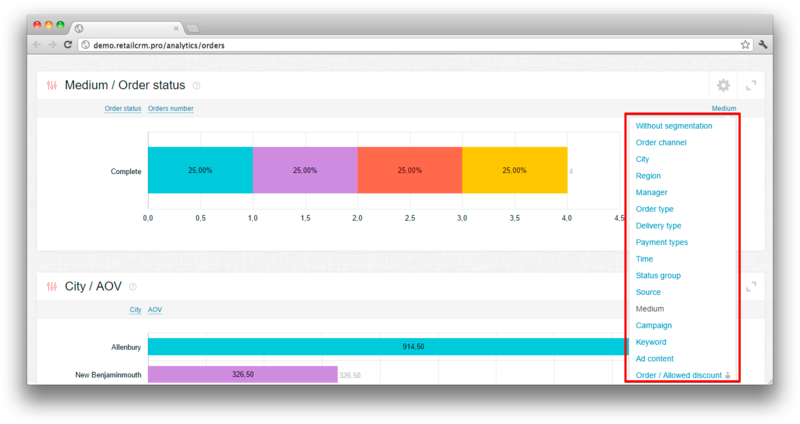 Shows the time being in status by the definite order type. Shows time in the status by the definite delivery type. Shows time in the status by the definite order type. Shows time being in the status by months. Shows time of order from a definite source being in the status. Shows the time of order from a certain medium being in status. Shows time of order from a definite campaign being in the status. Shows time of the order being in status by a definite keyword. Shows time of order being in status by a definite ad content. By default the widget shows the dependance of cancel statuses groups on statuses, from which they were moved to. In other words it is shown on what stage of the purchase funnel the customer has become lost. The horizontal axis shows the number of orders. It is possible to change it to income, margin and the paid sum. The axes, where the cancel statuses and the order statuses are situated, can be switched. After that you will see another 3d graph - the dependance of order statuses and cancel statuses, their quantity and the percent composition of cancel statuses, which came out of the definite order status. When mousing the area highlighted by the colour, the information in one line is shown, collected from all axes (the value from the axis to the right, horizontal axis, the name of the column and percentage in brackets). Also, when mousing, a caption below the graph appears saying, that if you click the line, you will see the detalization on the definite status. You can see on the screenshot, that this way the filter on “Bought elsewhere” status is set. An additional parameter appears in this detalized report on status - “Manager”. The report is built in the view of this new parameter, that can be changed to another order parameter, for example, “Order channel”, and the situation with cancels can be seen on it. The horizontal axis, for example, can be changed to “Income”. This is how the picture on status “Packaged” looks, from which orders moved to different cancel statuses in the view of different order channels. If you press the gear in the upper right corner of the widget, the settings will open. Filter orders by cancel date, and not by the order creation date. Near the gear there is a “Maximize” button. 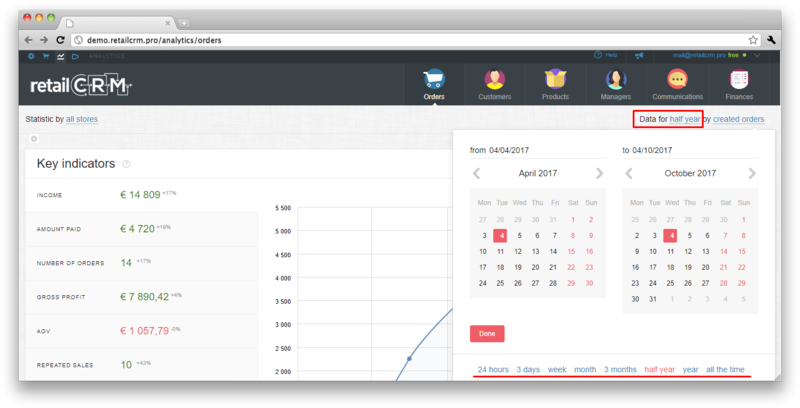 Presing it, you will get several reports at once, where the horizontal axis is changed: Orders quantity, Income, Margin, Paid orders. 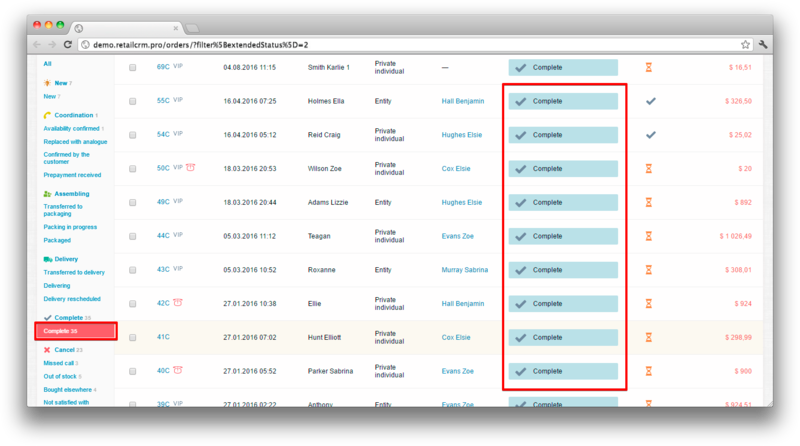 In maximized mode it is also possible to download every report separately. The universal widget allows you to build personal reports on specified parameters. Let’s have a look how the universal analytic widget is organized, how you can make reports on the indicators you are interested in, how to configure indicators axes for getting more detalized information display on the searched parameters. In the right upper corner of the widget there are two icons: “gear” and “diagonal brackets”. 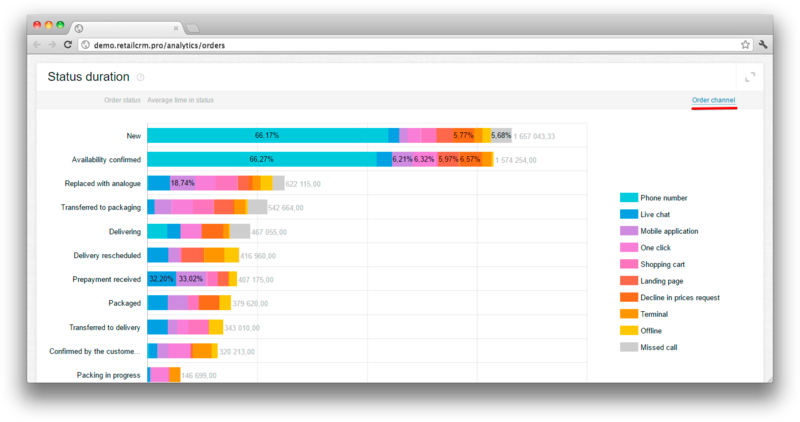 If you press “diagonal brackets” button, you will see the report in maximized mode. 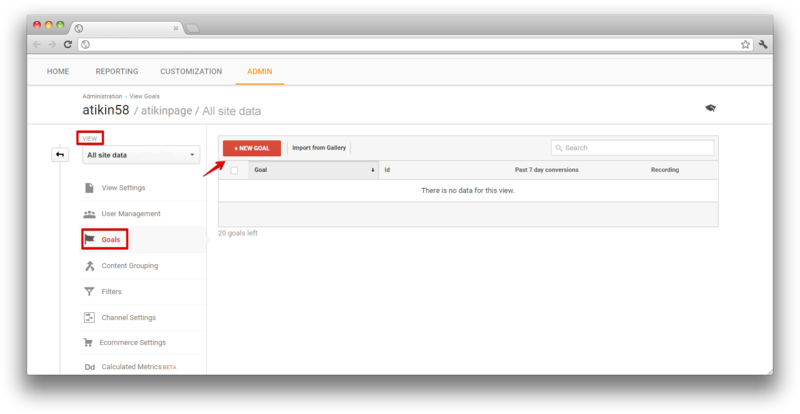 It is possible to export data in maximized mode in one of four formats: xls, csv, xml, json. The system can export 500 records maximum. If you press the “gear” button, the panel will open, where it is possible to specify on what orders exactly the statistics is built. By default it is set “Do not consider cancelled orders”. So the report is built on all orders with the exception of those, that are in “Cancel” status. Do not include orders with zero cost — if you tick the box near this filter, the orders with zero cost will not be considered, for example orders made over the phone. Do not include delivery cost — if you tick the box near this filter, the order net delivery cost will not be considered. For example, the delivery cost is 10$, and the net cost is 6$. In this case 6$ will not be considered, and 4$ will go to the shop income. If you turn on this setting, the time period that is specified in the global filter will not limit orders by the date of creation. Instead of this every line of the widget will show the statistics only on those orders, which moved to the current status (for “Order statuses” axis) or group (“Status groups”) during the specified period of time. If this setting is active, and the parameter “Time” is specified for the third axis, then its values will also be specified not by order creation date, but by the date of moving to the current status/group. For example, if the filter period “Data for a week” is active, and “Status groups” are chosen for the first axis, and the setting “Filter orders by the date of transition to the status or status group” is disabled, then the number of orders created during the previous week and being in the “Delivery” status group, will be displayed in the “Delivery” line. If you turn on this option, the data on created at any time orders, being in “Delivery” status group at the moment and also being moved in this group during the previous week, will appear in the same line. It is possible to set and vary a great number of parameters for analytics in all widget axes. The first axis is the indicator, the data on which you are interested in, for example, Source, where the customer came from. Pressing the name, it is possible to change this indicator, selecting the needed one from the drop-down list. If in the first and the third axes it is possible to apply a lot of parameters for making a report and adding of new is allowed, then the second axis has a strictly limited number of parameters. In detailed view you can see several graphs filtered by the second axis. The creation of the third (non-mandatory) axis is implemented in system - the segmentation of the columns. The new additional parameter for analytics divides the column to separate fields that allows to get more complete and detailed information on the criteria needed. 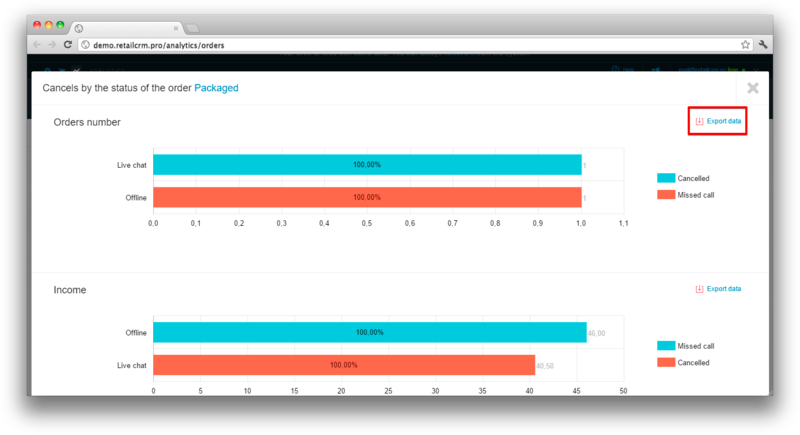 As for the mandatory axes it is possible to select needed parameter for analytics. If, for example, Sources are specified for the first axis, then for the third axis it is possible to select any other parameter from the given list, except Sources. Note: when selecting “AOV” parameter for the second axis, segmentation on the third axis is unavailable. By selected mandatory axes Source/Income let’s, for example, specify segmentation using «Region» indicator in the same graph. The column has been divided to parts - segments. It became possible to view the income amount, received from sources where the order came from, in percent, and due to segmentation we can see from what regions orders of your website visitors came. If the thirs axis is specified, the widget heading is formed as [3-rd axis] / [1-st axis]. 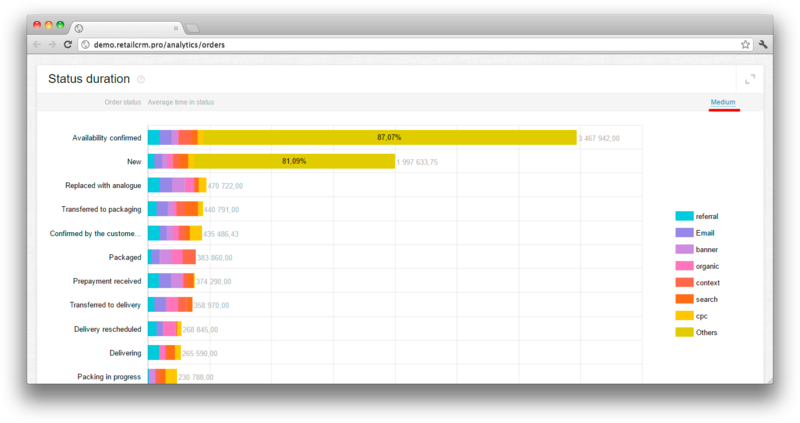 Additional data, on which analytics can be collected, can be added to the system. They are created as user fields in section Administration > Settings > User fields. 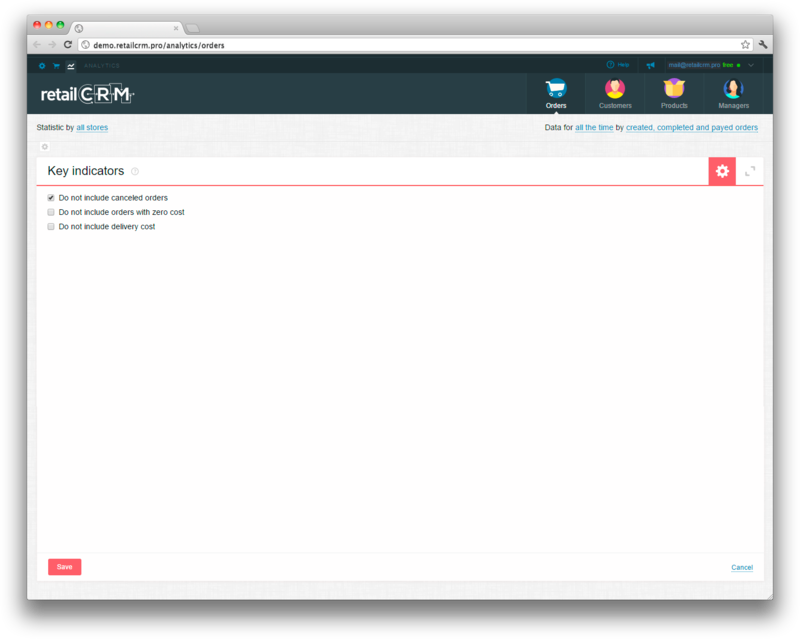 You can read more about additional data creation in the article «User fields». The additional data in the drop-down list of the first and the third axes are marked as a human figure and are situated under the main indicators list.